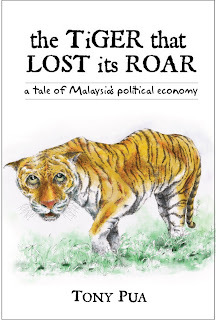 "The Tiger That Lost Its Roar", a tale on Malaysia's political economy has just been published. I've been asked to give a synopsis on the book, which tends to be a little difficult when it's 350 pages and covers a wide range of topics. But I thought the Foreword in the book provides a good background to what I've written, so I'll "blog" it here for those keen to find out more. It's still kinda long, so enjoy ;-). For those keen on having it shipped to you (a personal autographed copy), before the book hit the bookstores perhaps in a month's time, you can order direct, details here. 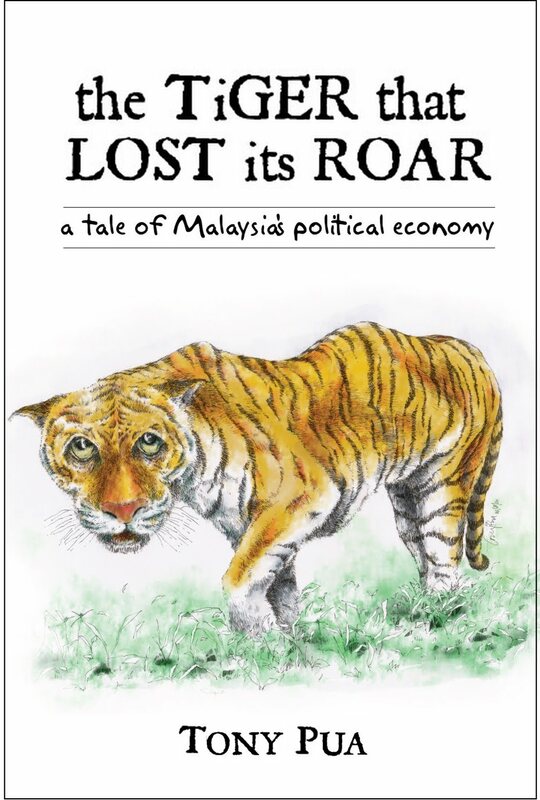 In writing and producing this book “The Tiger That Lost Its Roar”, a book on Malaysia's political economy, I wanted to present the state of Malaysia's economy, supported by all the necessary facts and figures, in a fashion which a typical man-on-the-street will be able to easily digest and understand without complicated jargons or abstract economic theories. The economy is a subject matter which affects all Malaysians, regardless of race or religion, age or gender, but it is often poorly understood or worse, neglected as a subject best left for the “authorities”. At the same time, the developing Malaysian economy is deeply and inextricably intertwined with the country's politics. Any attempt to decipher the former, without understanding the impact of the latter will only give a distorted abstract on the relevant issues. What is perhaps the most important is to debunk the myth that “politics and economics do not mix”, and what happens with the countries' politics, whether it is race-based policies or political rent-seeking and patronage does not significantly affect the economy at large. In the past, it is often heard that patronage and corruption can be tolerated, as long as projects get completed and the economy continues to grow at a rapid pace. It's a “win-win” situation, so what is there to complain. However, the above cannot be further from the truth as Malaysia had sacrificed the future growth and prosperity of the country and our future generations to create this short-term feel-good mirage of economic euphoria, particularly in the 1990s. The Barisan Nasional government then continued to maintain a facade of economic growth in the 2000s with the support of windfall oil and gas income, papering over cracks which have started to widen significantly. It was with the drastic drop in global oil prices in 2008 which finally “exposed” the naked emperor, triggering a whole series of supposed “reform” measures in the guise of the “New Economic Model”, the “Government Transformation Plan” and the “Economic Transformation Plan” to slam the brakes on our economic decline and reverse the years of damage caused by not only our economic policies but also the country's politics. I wanted to relate in this book how the economic implications of its politically-driven policies had severely affected the performance of our economy, and how our economy cannot be reformed without transformative changes to the entrenched political culture in Malaysia. Putting this book on Malaysia's political economy together has certainly been a lot more challenging than I had initially anticipated. There was a ready pool of source materials for the book, which was in the form of my articles and columns written for my blog and newspapers respectively, as well as hundreds of press statements which I have written over the past few years. However, I didn't want to turn the book into a compilation of articles and statements which are related, but aren't properly “connected” in the context of a book. In addition, such articles will often carry repeated background information on particular issues which will not contribute towards an easy-to-read, concise and coherent book. Hence much time was spent not only on organising, integrating and editing the hundreds of existing articles into cohesive chapters for this book, I realised that I had to write many new sections, or even brand new chapters to ensure that readers will be in possession of a more complete and coherent picture of the “stories” which I'd like to tell. The chapter on the RM12.5 billion Port Klang Free Zone (PKFZ) scandal for example, got expanded to 2 separate chapters due to the amount of “juice” flowing from the story, which if left unwritten, will do injustice to the scandal. After all, it is the ultimate example of a “perfect brew” of BN politicians from various parties getting their fingers dirty with crony businessmen, stinking of corruption and abuse of power, abetted by blissfully ignorant and incompetent government officials and unchecked by the country's top enforcement agencies. The scandal probably deserves a book on its own, but for the moment, a condensed version packed into 2 chapters will suffice. The initial chapters gives the macroeconomic overview of the country's economy and the country's defining economic policies, the overaching “New Economic Policy” and its proposed replacement the “New Economic Model”. This is followed by the chapters reviewing the Government's privatisation policies on highways, water and electricity and their lasting distortionary implications. Readers will then be “treated” to a series of scandals which reflects the decay in governance and its impact on our tax-payers' funds. These scandals further exacerbate the misallocation in the Government's budgetary expenditures, particularly in the accelerating operating expenditure which puts to waste the immense windfall revenue contribution from the oil and gas sectors. The ineffective use of crude interventionist policies such as price controls, subsidies and fiscal instruments further destroys competitiveness and efficiency, without at the same time achieving the objectives of such policies in the first place. Finally structural issues within the Government, particularly that of the civil service, as well as infrastructural bottlenecks such as the country's transportation system, or the lack of it, with their root causes in politics, continue to impose an artificial glass ceiling on the growth potentials of the country's economy. On top of all of the above, in my personal view, the biggest failure of the BN Government is its inability to protect and develop our excellent pool of human capital due to political expediency. Our economy has been able to remain “above water” thus far has less to do with the socio-economic policies of the Government, but in spite of it. This is because the Malaysian human talents were able to make do with whatever limitations and hurdles placed in their path. The chapter “Education Simplified” tells the simple tale of how our education system has been desecrated and debased, which not only fails the future generations of Malaysians but also at the same time encouraged them to look for greener pastures overseas. The book isn't meant to be a book of unbridled negative criticisms with no corresponding positive and constructive proposals. Throughout each of the respective chapters, alternative policies with varying degrees of detail are outlined to achieve the goals for economic competitiveness and efficiency while protecting social and distributive justice for the man-on-the-street. I've also called for a “New Deal” to overhaul the archaic and increasingly centralised planning, decision-making and implementation of the government machinery which not only makes a mockery of our federal system, but severely restrains the development of dynamic regional economies in the country. 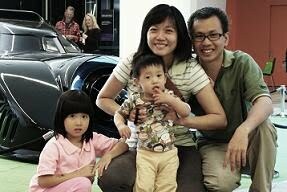 Malaysia today is a “tiger” that is weak and impoverished from years of neglect, abuse and malnutrition. As a result, it has not only lost its bite, it has lost even its roar. However with the necessary tender loving care, the right dose of medication and therapy, the Malaysian Tiger has every opportunity to bounce back, stronger than ever before. This can only happen if the Government of the day has the political will and moral courage to face its demons, place the interest of the rakyat above that of the vested interest parties and slaughter the sacred cows. With the country on the cusps of change, there is no better time to bring back the Malaysian roar. You might want to consider to have the book translated in Malay and get published too, so that it can be reached to a bigger audience, and thus give bigger impact. Looking forward to buying a copy when it appears in the bookshops. Please continue writing articles and books to enlighten the ordinary people of Malaysia. Now, how about a Malay version? Hi Tony, looking forward to the book. However, wonder if there's any plan for the book to come in language translations of Bahasa Malaysia and Mandarin? I love to analyse wise and experienced individuals' views and from there, learn how they look at things at a deeper depth rather than just at the mere surface. It's a blessing for us rakyat to have you to continue tirelessly in order to improve the country in every possible way. May our support for you drive you further to achieve more for us in future. Look forward to reading your new book. Do you by any chance also consider publishing it in electronic format as well? Keep up the good work. The country needs more people like you. Bought your book last week. It was on the top ten in Borders Bookstore (no. 3 I think). I'm sure I have a pleasant time (or not because of all the "juice" inside) reading it. I have read the book, and i felt that it should be translated into other languages - Bahasa and Mandarin. Congratulations on your book! I'm currently reading it (somewhere at page 130++) and found the stories/case studies in there to be gripping, sad and outrageous at the same time (especially the 2 chapters on the Tun Lim Liong Sek case). So well done!! However, I do have one major complaint about the book - it has NUMEROUS typo errors. The errors are simply so many that sometimes I wonder if the editor or proofreaders have actually done their job and this problem does interrupt the "flow" of the juicy stories in the book. Therefore, I sincerely hope that you will fix this problem in your follow-up editions so that I can buy copies of them to give away to friends and family. P.S. yes it should be translated into other languages!! YB, thanks for another book. We need a BM version, so that more people can understand. "The Tiger That Lost Its Roar" Out Now! Competitiveness Rankings Drop: Just "Perception"? If Subsidies is "Opium", Who's the Drug Lord? Subsidy Cuts: Where are the Mitigation Measures?